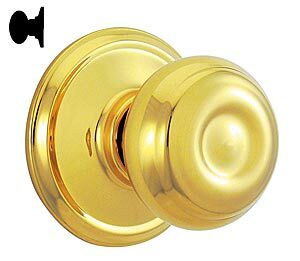 The Schlage Georgian A-Series commercial keyed and non-keyed door knobs locks utilize the Schlage original A-Series cylindrical chassis with stylish knob designs supported by heavy duty spring cages. This design provides strength and performance in the more abrasive commercial Grade 2 applications. The Georgian A-Series is non-handed and is available in a wide variety of keyed and non keyed functions. Applications: Heavy-duty residential, light- and medium-duty commercial. Single Dummy Trim - Dummy trim for one side of door. Used for door pull or as matching inactive trim. Please call or use our Online form to receive an RGA (Return Goods Authorization) number within 30 days of purchase prior to returning merchandise, returns WILL NOT be accepted without one. No restocking fee on items listed online. Restock fee may apply to any special ordered items or finishes not listed online. Please call to check before placing order. Defective products will be replaced.